This brand new home will be move-in ready by March 2018! 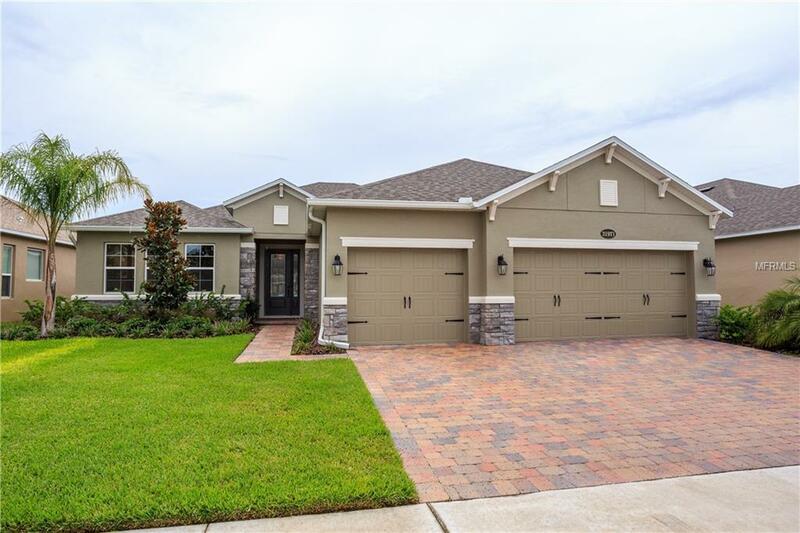 It has an open concept plan w/many great layout features including a kitchen that opens to the great room, a private office area w/double doors, formal dining space, large covered lanai perfect for outdoor entertaining and a private split bedroom layout with the master bedroom located on the left side of the home and 3 additional bedroom located on the right. The interior finishes include cream colored cabinets throughout, 42" upper cabinets at kitchen w/crown molding, bronze hardware & glass inserts, granite kitchen & master bath counters in "New Venetian Gold", GE microwave, range & dishwasher in the color "Slate", 8"x36" tile in all wet areas & main living areas, stainless steel farmhouse sink at kitchen island, tile kitchen back splash laid out in a brick pattern, neutral custom interior paint in "Sheepskin", tray ceiling at foyer & master bedroom & a sink at the laundry room. This home is also 100% Energy Star 3.1 certified and built to M/I Homes Whole Home Standards. That means quality construction, the home will be affordable to operate and you can save money on your energy bills. Some of the energy saving, Whole Home features include Core Fill insulation in the block walls, R-38 ceiling insulation, Low-E double pane windows & sliding glass doors, full perimeter rebar including the garage, 3,000 psi concrete foundation and a raised heel truss system that allows insulation to go all of the way to the eaves.